Welcome to Glasgow Eco Trust – the new name for Dumbarton Road Corridor Environment Trust! We deliver a range of environmental projects and services across the west of Glasgow and beyond. We protect and enhance the local environment and increase the wellbeing and resilience of local people and communities that we work with. The United Kingdom Without Incineration Network (UKWIN) has today launched a report that looks into the climate change impacts of waste incineration in the UK. 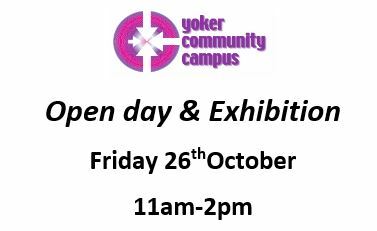 Yoker Community Campus is having an Open Day & Exhibition from 11am to 2pm on Friday 26 October at 10 Kelso Place, Yoker G14 0LL. The Campus will be celebrating the work of the participants in our INCLUDED programme, the relaunch of the Campus Cafe and the work of all our partner organisations. Drumchapel and West Winterfest 2018! This year’s Drumchapel and West Winterfest will take place on Monday 5 November from 4:30pm to 8:30pm in Drumchapel Park, Howgate Avenue, Glasgow G15 8LY. Don’t miss this fun filled family event that has something to suit all ages. Heart Radio presenters will be entertaining you throughout the evening. There will be a live music stage, funfair rides and stalls, not forgetting the outstanding firework display, which will be going off with a bang at 7pm.